After being forced to cut short a planned European tour by the November 13, 2015 terror attacks in Paris, American rock band Eagles Of Death Metal has announced that it’ll soon be embarking on an expanded North American and European tour, with more than 50 dates set for the next six months. The tour will kick off next month in Vancouver, BC, before moving down the East Coast of the United States and into the rest of the country. 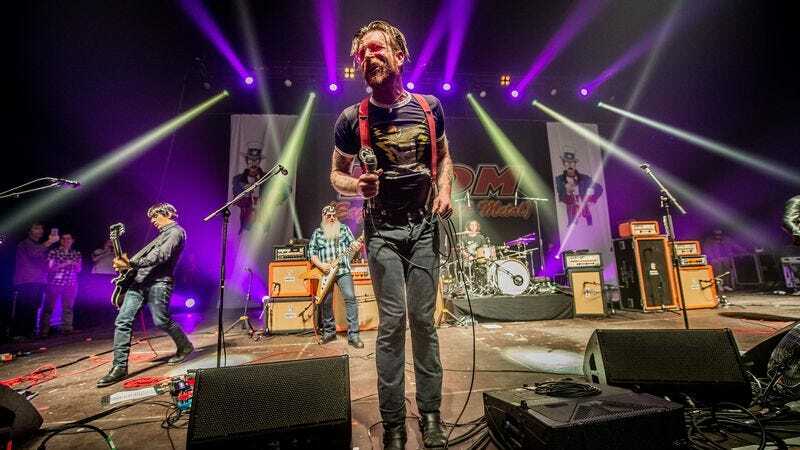 That leg will finish up in July, at California’s Lost Highway Festival, before the band hops the Atlantic for gigs in Poland, Denmark, and France, where they’ll return to Paris for a show at the Festival Rock En Seine, on August 26. The group members are also continuing their Play It Forward campaign, in which they encourage other artists to cover their song “I Love You All The Time.” Proceeds from the covers—including any publishing fees owed to EODM—will then be donated to The Sweet Stuff Foundation, a group that supports career musicians and engineers struggling with disabilities or illness.